Penguin's Family - The Story of the Humboldt Penguin is a gorgeously illustrated title in Oceanhouse Media's Smithsonian Collection - a series based on popular non-fiction print titles about the natural world. The print version of this title was released in 2004 along with an audio CD. As an OM book this title sparkles, giving enormous value over its print counterpart, including narrated text that highlights as read. This book series fills a great need for digital book apps with non-fiction educational content. The books selected so far have been well vetted as print titles, making it easy as parents & educators to select these digital books with confidence. Each title in this series takes the original print images and pans over them in a nice, semi-animated style. There is also a nice array of sound effects, like ocean waves and sea gull cries, paired nicely with a great male voice-over. The sound effects also help the story come alive without overshadowing the narration. Overall, this is a solidly made book with nice enhancements. If you tap anywhere on the page, words appear that represent the different images (e.g. 'water', 'sea floor', 'penguin'). If that word also happens to be part of that page's text, the word is highlighted within the text of the story, helping young readers make important connections between the written and spoken word. Paired with Oceanhouse Media's "OM" template, non-fiction titles get a clear educational boost when print goes digital. 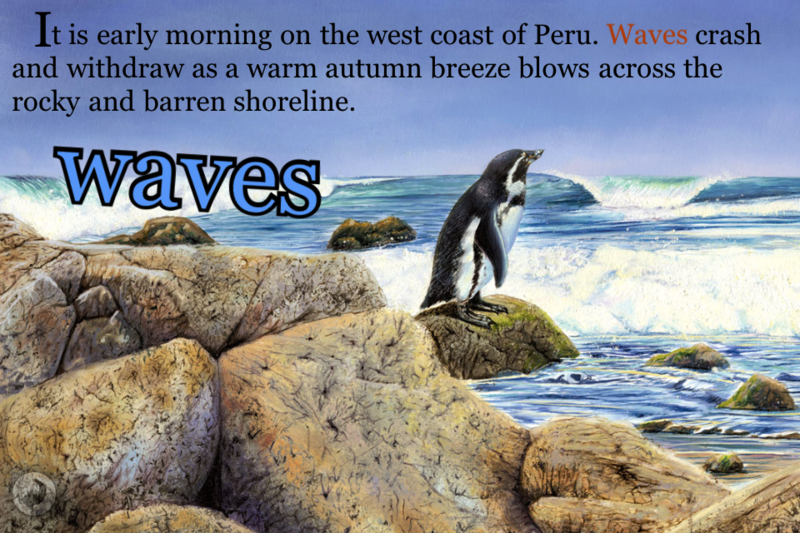 The story begins on the coast of Peru with a male penguin sitting on an egg. The mother & father penguin, the story tells us, have cared for this egg for more than a month, taking turns sitting on it to keep it warm. When the chick is ready to hatch there is a great deal of light tapping as he makes a hole in the shell with his tiny beak. Soon a tiny bird emerges and the parents keep him warm as his feathers dry. The mother also feeds the penguins mashed up anchovies she has pre-digested so baby penguin can have his first meal. They take turns caring for the baby for 4 weeks - it is a full time job. The parents must also protect their new baby from danger, like a 'fulmar' (seabird) diving toward the naive chick. But by 10 weeks old, baby penguin learns to swim on his own. There is a cold current the penguins swim down to at the sea floor, but they still must pop up for air every few minutes. Eventually baby penguin takes his first swim to find food on his own. He finds a school of small fish that he gulps up as fast as he can. Danger appears under water in the form of a Sea Lion. The little chick escapes unharmed - a very close call! The penguins call out to find each other with a loud donkey-like noise. They can recognize the calls of penguins they know. Humboldt Penguins live in a flow of cold water off the cost of South America. They are endangered. The end.